These display the intensity of your workout, your stroke rate, your heart rate, your zone bar, duration, and distance traveled. Plus, the monitor is compatible with a heart rate chest strap and receiver. The monitor can also be connected to a computer to further analyze the data collected during your workout. You can use this information to train further, race with your friends, or simply keep a record of your progress. The rower is handcrafted in solid ash and stained honey. 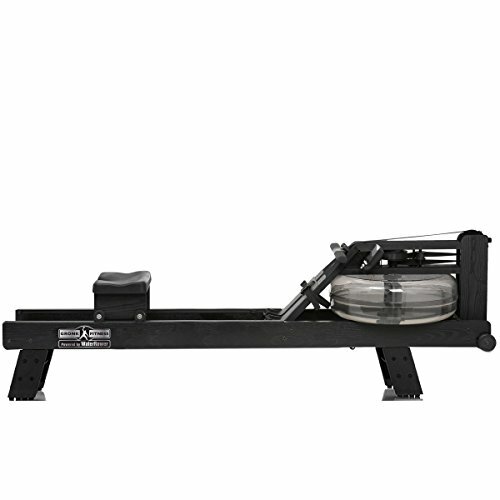 The wood was chosen especially for its ability to absorb sound and vibration, making the rower extremely quiet. It is also worth mentioning that the wood is harvested from replenishable forests and has been finished with Danish oil to provide a deep luster. Other features include dual rails with four corner wheels to increase the seat stability, a frame that flips upright for storage, and an incredible weight capacity of up to 1,000 pounds. The WaterRower Natural Rowing Machine measures 84 inches wide by 21 inches high by 22 inches in diameter, weighs 117 pounds with a full water tank, and carries a one-year warranty on the frame and components. WaterRower will upgrade the rower’s warranty to five years on the frame and three years on the components once you complete a registration form.